My favorite type of car is electric. An electric car is very practical for someone like me with a very short daily commute. In fact, most Americans drive less than 40 miles per day, making electric cars very sensible. It would be great to have an electric car (powered with clean energy), and a hybrid or some other lower emission car for longer distances. Unfortunately, electric cars are not ideal when we’re tied to a coal-based power grid. The best option is to use renewable electricity. Currently, that’s hard to come by, but now you can charge your car or your home with the LifePort Solar Carport. LifePort has built a carport with a solar roof that provides enough power to charge your car, for free! (that sounds like a commercial, but I think it’s pretty cool) You can even hook the carport up to your home, and power your home during the day while your car is with you at work. 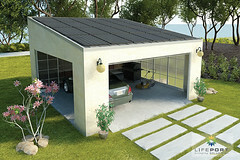 Here are some specs on the LifePort Solar Carport, taken from their website. Someone could even insulate the carport and turn it into an office or rec room. The price is high to start, but the return on investment based on increased property values is outstanding. Not to mention the environmental benefits… never having to buy gas again… lower electric bills… the list of benefits goes on and on with renewable energy.